ASP.NET Forums/General ASP.NET/Getting Started/how do i get the categoryname from fields instead of properties? how do i get the categoryname from fields instead of properties? Re: how do i get the categoryname from fields instead of properties? My best guess is you are trying to fetch information stored in an attribute. Is there anyway you can provide the attribute, class, and expected results? i have already came acros that article. it doesnt explain how to get the category name from a field. it doesnt cover fields at all. Like many of your posts, there is not enough context to understand what you're trying to do. For the second time, post the class source, attribute source, and explain what results you expect. i want to get the Category name of a field. 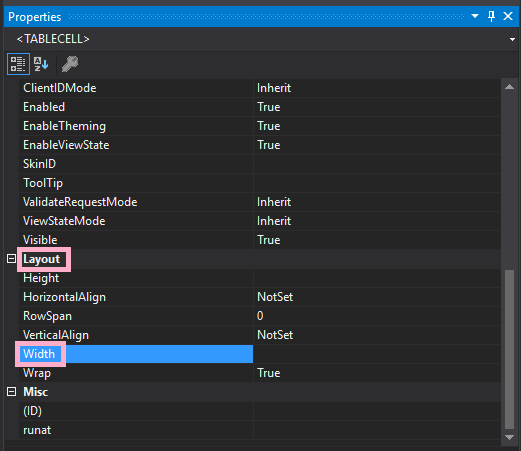 The visual studio property window also gives the categories of fields. its the same thing that im trying to do. Maybe this is what you're after. What are you calling a field? Is "Appearance" what you're looking for? what you sent, was a property. I know what a field is but you're questions generally make little no sense and you don't provide code. So I have to ask clarifying questions. Do you have a class with a field named "categoryname" and you want to use reflection to get a this field? no. i have a field. lets name this field MYFIELD. for example, provide me code that extracts the category name 'LAYOUT' from the field 'Width' from a tablecell object. What tablecell? I give up. It is abundantly clear from this and previous posts that you are not on the forum for assistance... Good luck. the table cell is just an imaginary context for you to understand what im trying to do. The thing is i dont have a context, i just try to do things that would work in ANY context. in the mean time. can you make code that extracts the category name from a field? how to get the category name from a field? but how to do this with fields instead of properties? | for example, how to extract the category name 'General settings' from this 'Field' field. it exports a CustomattributeData object to a string, and then i just fish the category name out of that string using splitting. but is there a safer/more straightforward way to do this? The FieldInfo class contains the information for the fields and we could get the attribute from it.